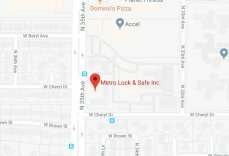 Avoid Being Scammed By Fake Locksmiths | Metro Lock & Safe Inc.
Posted on September 26th, 2013 by Metro Lock & Safe Inc. There are many unscrupulous people who might want to take advantage of your misfortunes to rip you off. There are fake locksmiths who might exploit you when you are vulnerable in order to gain entry into your premises or car and then rob you. You should take care when you are contacting locksmiths to come and help you out of a lockout situation. One of the things you should insist on is the licensing. Fake locksmiths do not bother with getting the necessary approvals from the relevant authorities to carry out their business because they know it is not genuine. Those professionals who are serious about their work seek to comply with all the requirements for running a business in every jurisdiction. The scammers will not have the necessary expertise to open a lock. Their main aim is just to get to your property where they can then overpower you and steal your property. Even if they are not robbers, they might end up causing damage to your door by using crude methods to open the lock. They are not professional in their dealings. The availability of fixed premises is something that you should look for. It is important for the locksmiths to be mobile in case of emergencies but also having an address where they can be reached physically is important. This is where important information and documentation such as licenses and qualifications will be located. It might also be the workshop where they will have the machines for cutting the keys as well as storing the locks and other security systems they might have for sale. Another factor that can set apart the scammers from the genuine locksmiths is insurance. There is always a chance that damage may occur in the process of repairing the door. A scammer will not compensate you while a genuine locksmith will have no problem paying because they are covered by insurance. When it comes to payment, the scammers are usually non- committal. A professional on the other hand will be willing to give a written estimate of the costs which forms part of the work agreement. The unethical locksmiths will try to inflate the prices once they begin. They know they can press you to pay exorbitant fees if they threaten to compromise your security locks. Shopping around to know the market rates can help you prepare for what to accept in terms of payments. If you are dealing with a company to provide the services, you should always insist on proper identification. There are people who might know the company you use and try to impersonate the staff of that company in order to fleece you. A reputable smith might also go an extra mile and ask for your identification to ensure you are the rightful owner of the property. When you deal with professionals to repair your locks, you will notice that you have fewer problems. When you work with scammers however, you are always requiring their services either to fix the locks or to replace broken or worn out keys. This is why conducting a diligence search is important before you make a hire. It will go a long way in helping you chose a good locksmith.